You read that properly when you asked to if I was serious about writing about what’s going on in my love life to start each and every review. What I’d like to do is basically tell you what’s going in in my life. The love part is just because my life is so full of love that my entire life IS a love life. So what is going on? Well. Not TOO much, I guess. I had a wonderful Thanksgiving in which I absolutely pigged out on turkey and pie. And then today I annihilated my credit card at Nordstrom Rack for black friday. But it’s just money. Right? Sure, Allie. Sure it is. Just wait til your autopay kicks in and you can’t afford Whole Foods. Then let’s see how smug you are. Let’s see what happens when you can’t afford to buy your precious protein supplements like Nutrabio Muscle Matrix. Ugh. Well. Like all the rest of the horrible decisions I make in my life, let’s just do whatever the impulse tells me, and deal with the ramifications later. (I highly DON’T recommend this strategy). Ok. Time to talk about Nutrabio protein, huh? Well. I guess this is the second (or third?) Nutrabio product that I’ve tried. I know I tried their Thermofuel fatburner and did a review on it. I feel like I reviewed a Nutrabio pre workout too but i don’t have wifi right now so I can’t check. Hashtag 20,000 feet and ain’t paying for gogo in flight. Traveling folk you feel me. But, yeah. I actually have some nice things to say about Nutrabio in this review. Let’s start with the flavor grade. 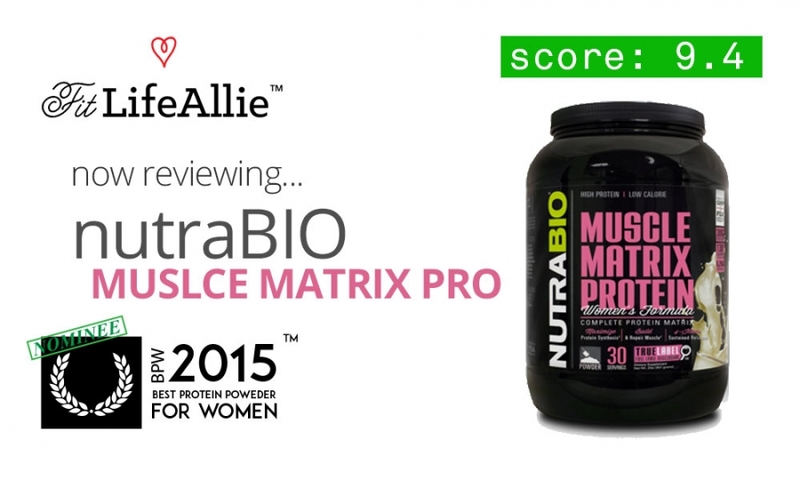 Nutrabio came super close to hitting it out of the park with the taste of Nutrabio Muscle Matrix for Women protein. They created a protein that is smooth, mixes well, and has a really nice flavor profile. It’s really pretty great. The flavor that I tried was the basic chocolate falvor. I feel like the most recent proteins that I’ve tried, I ended up liking the vanilla protein flavor more than the chocolate. I know this was the case with Adaptogen Tasty Whey (read my Tasty Whey review here). The Nutrabio chocolate flavor has some really interesting depth and dimension to it’s flavor that I want to try and give you a feel for. The first notes of flavor start when you raise your glass up to your mouth for your first sip. There are intense notes of dark chocolate that are totally unexpected from a protein like this one. The taste, however, betrays those initial aromas. There is really not so much dark chocolate at all once the liquid hits your lips. Your taste buds instantly get a shot of smooth, rich, MILK chocolate. Almost exactly like a well-made glass of Hershey’s chocolate milk. Made with WHOLE milk, none of that skim crap. I really enjoyed the finish of the Nutrabio protein as well. There was no questionable aftertaste. No strange sweetener taste that makes you pucker up your lips. This stuff tastes good through to the end. I give it an 8.9, JUST below an exceptional grade because I honestly needed there to be just a little more sweetness to this flavor protein powder for women. In milk, the natural dairy sugars get it to the level it needs to be, but on it’s own, in water, this flavor is just a little flat. Overall it’s good though. I need to try some of the other flavors and see if they are equally as delicious. So what I really like about these macros is the ration of protein to fat and carbs. While this isn’t the largest dosage of protein per serving that you’ll find on the shelf of your supplement store (18g), it is a really nice ratio to the other two macros. And what I was doing to bump the protein up to 27g per serving was just take two scoops. Now. You’re going to burn through the tub much faster that whey (see what I did there), but it might be worth it if you can find a reasonable price for Nutrabio Muscle Matrix Protein. Here’s why: The protein sources are super high quality. The first source of protein listed comes from WPI, or Whey Protein Isolate. At 11.6 grams, this is a really strong dosage of whey. That makes Muscle Matrix an excellent choice for immediately post workout, since whey is rapid-digesting and will create a wonderful environment for muscle recovery and growth. The second protein source in Nutrabio’s Female Protein is the Micellar Casien. This slower digesting protein, found in other premium blended proteins like Body Nutrition Trutein, is going to keep a steady trickle of amino acids headed into the muscles even after the whey has been digested. This will further enhance your recovery while taking these protein shakes. The only other ingredients in here, which amount to less than a gram total, are the flavoring ingredients. This product DOES use ARTIFICIAL flavorings so please do keep that in mind when you are considering this protein. Some alternatives that are naturally flavored and sweetened are Gardenia and Vega One Protein. I think Nutrabio has always done an OK job with their products from a packaging standpoint. You won’t get anything terribly pretty from the green and white themed company, but you do get a flash of pink on their women’s products such as Thermofuel and Muscle Matrix. The shade of pink that they use is actually quite pleasant to look at, and gives me the sense that the product is going to taste good. I would describe the pink as ‘Turkish Delight Pink’. If you say the original ‘Chronicles of Narnia’ animated movies, you know exactly what scene, and color I’m talking about. (‘The Lion, The Witch, and the Wardrobe’, scene where the witch gives the little boy who’s name escapes me the candy and lures him in). But Narnia aside, let’s talk about some other design elements of this protein product. The jar itself is black, with a black label. That means everything type-wise is reversed out from the black, making it really pop. The Nutrabio is displayed vertically on the left-hand side, while the right is used for a ‘flavor splash’. Other pertinent information is arranged below the bold, prominent product name ‘Muscle Matrix Protein’. I think overall this design WORKS. There is alot of information to convey (as per usual with supplements), but Nutrabio design team has done a nice job of getting everything on there, in a fashion such that the important stuff is immediately consumed, while the rest is there for the taking. But yea. I think this product looks pretty good. Certainly nothing to be ashamed of leaving this protein out on the kitchen counter.